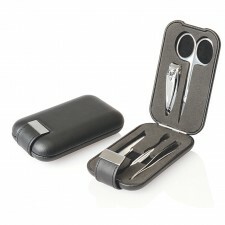 Each set of this personalized gift provides a set of quality tools in attractive packaging. Look sharp… good grooming is essential if one wants to convey professionalism and these personalised promotional manicure sets will do just that for your promotional campaign. There are a variety of sets to choose from, and each set provides a set of quality tools in attractive packaging that can be printed or laser engraved with your company logo.